Over the past six years Randy Olson has conducted a range of workshops related to the broad communication of science and environmentalism. For five years Randy Olson and Ty Carlisle have taught an intensive three day videomaking workshop for new graduate students at the Scripps Institution of Oceanography. 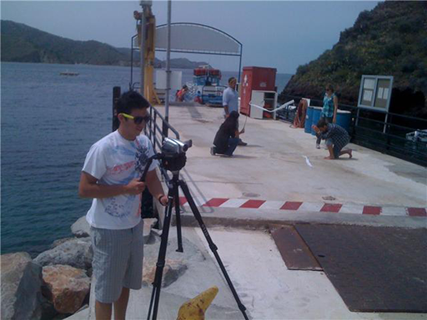 The basic elements of this workshop are described here. The workshop has also been conducted at University of California, Merced, and the University of Southern California. It's a transformative experience for students and faculty who have never seen their words go from paper to the screen in just three days. 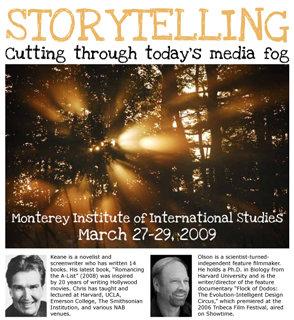 At the Monterery Institute of International Studies Randy Olson teamed up with veteran screenwriting instructor and author Christopher Keene to teach a two day storytelling workshop to the graduate students. The importance of storytelling to the broad communication of science is the core element of both the book and the online journal. 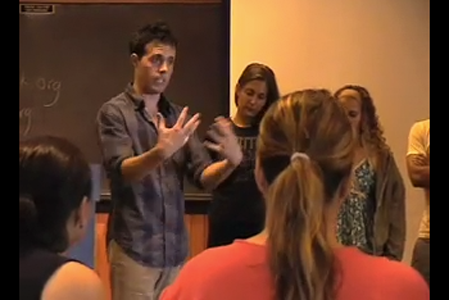 For the past four years, as a part of the Scripps communication workshops, Randy Olson has teamed up with instructors from the Groundlings Imrov Theater of Hollywood to bring the techniques of improv acting and comedy to graduate students in science. For a detailed explanation of why this is far from a crazy idea, read his interview with veteran Groundlings instructor Jeremy Rowley on The Benshi.